DeMontrond RV Rental is not associated with RVshare. 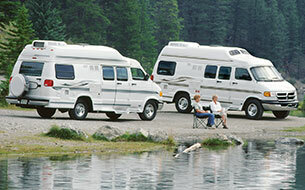 This page is simply a resource, providing more information on all RV rental options, including DeMontrond RV Rental. From the Sam Houston National Forest to The Gulf Coast, Houston is surrounded by beauty on all sides. It’s a popular tourist destination due to its bustling downtown and vibrant nightlife. Outdoor enthusiasts also flock to the area as there is much to be explored just outside the city limits. The area is also home to a wealth of campgrounds, state parks, and wildlife refuges, which offer RVers plenty of places to stay. 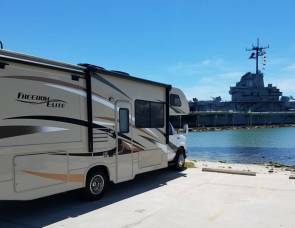 Texas is an RV-friendly state, to say the least, and not many places have such a concentration of RV dealerships and rental services. If you’re looking to buy or rent an RV, there’s no better place to find a good deal than in Texas. DeMontrond RV is a family-owned and operated RV dealership with more than 60 years of experience. They’re known as one of the premier RV dealers in Houston, though that’s not their only location. You’ll find two more branches outside of Houston; Conroe to the north, and Texas City to the south. Having multiple locations allows them to offer an extensive inventory of new and used RVs of all shapes and sizes. They’re the only Good Sam certified dealership in the area, so you know their RVs are high-quality. There are a few things that set DeMontrond apart from other dealerships in the area, namely their Warranty Forever program and their exclusive RV Traveler’s Club. Both ensure that the customer feels like a valued member of the DeMontrond family and not like a one-time, big-ticket buyer. The full-service DeMontrond RV Service centers are authorized to work on more than a dozen types of motorhomes and trailers, most major appliances, and body work and insurance repairs. Their extended warranty program is one of the best – they offer 7-year/150,000-mile coverage on new RVs, and 4-year/48,000-mile coverage on most pre-owned rigs. When you become on DeMontrond customer, you’ll have the opportunity to join their Traveler’s Club with over 600 members. Buying an RV is a big decision, and they want you to get every penny out of your investment. 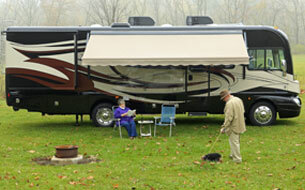 The club delivers inside info on special events across the country, new RV equipment, and special offers and discounts. They’ll let you know whenever there’s an upcoming rally so you can meet with other DeMontrond club members. The rallies offer a weekend of fun with free meals, a Margarita happy hour, and of course, free parking. For being 17 years old, this 2000 Tiffin Zephyr Class A is in great condition. It’s a diesel model with a Cummins engine with just under 70,000 miles on it. You’ll have plenty of room to spread out as this motorhome is 42-feet long and has a slide out on the driver’s side. Inside, it has luxe leather seating, tile floors, and light wood cabinetry. Shelves and cabinets line the walls, offering more storage than most Class A motorhomes. The listing price is $49,988 with financing available. This 2016 Thor Motor Coach Four Winds comes in at just over 35-feet in length. 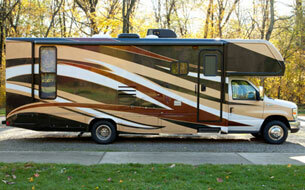 Also a diesel model, this RV has only 3,900 miles on it and will last you many years to come. It’s spacious enough to comfortably sleep up to eight people with a king bed and bunks in the back, cabover bed up front, and two convertible sleeping areas in the living room. It also features both an exterior entertainment center and outdoor kitchen! The asking price for this rig is $115,998. 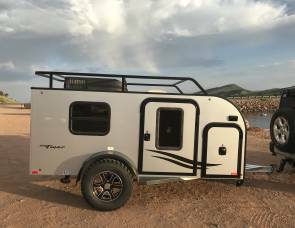 This 2017 Winnebago Voyage is on clearance for just $32,242. It’s a 32-foot Fifth Wheel with a queen bedroom in the back and a convertible sleeper sofa in the living room. The slide out features a corner entertainment center with a fireplace, and a table and two chairs. But the real star of the show is the design: solid granite-look countertops, hardwood floors, and a tile backsplash will make you feel like you’re in a luxury condo. It also features a residential-sized shower with a skylight. 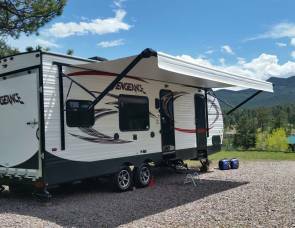 Where Can I Find a DeMontrond RV Rental Near Me? Unfortunately, if you’re looking for a DeMontrond RV Rental Houston, you’re out of luck. The company only offers sales and services. But don’t be disheartened! 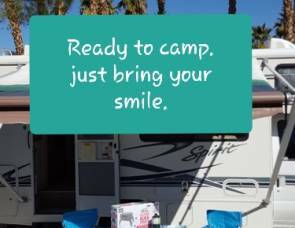 Check out the RVshare inventory to find affordable RV rentals in Houston and the surrounding areas. 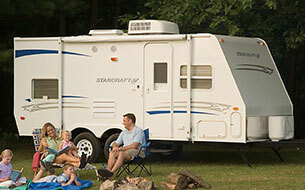 Our inventory includes RVs of all makes and models, even pop-up trailers and truck campers! You’ll work directly with the owner of the RV to negotiate terms and rental rates. With hundreds of thousands of listings throughout the United States, you’re sure to find an RV rental that suits your budget. Happy camping!